Not much really changes in the theater district over the years. Since the destruction of the original Helen Hayes theater in 1982 (where I saw my first Broadway show in the summer of 1977, a matinee of Equus, with Leonard Nimoy) most Broadway houses now enjoy New York City landmark status. This will (in theory) keep them from becoming skyscraper hotels, like the Hayes. Landmark status usually means the building owners can't make alterations to the exterior of the structure without prior approval of the Landmarks Commission. 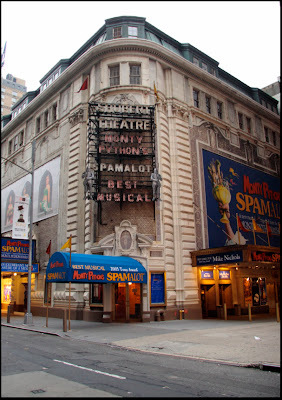 This stricture would normally include any signage on the buildings, though I think because of changing productions, the theaters get a pass as long as the style remains the same. Like a lot of theaters, the Shubert uses the distinctive open-faced 'bare-bulb' type lettering for its shows. Interestingly, those first eight shows opened on March 24th and ran for exactly three weeks. (Hmmmm...eight shows a week for three weeks makes 24 performances of nine shows for a total of 2.6 performances each. The IBDB doesn't go into much detail on this, and after 77 years I doubt anything new will turn up.) The Shubert then hosted its first musical, Three Little Girls; it ran for 109 performances. But while Shakespeare never had a long run here, A Chorus Line ran for 6,137 performances, a record for the time, and still had more than two years to go when our first picture was taken in February of 1988. As you can see, even the cabs in New York were in sorry shape back then. 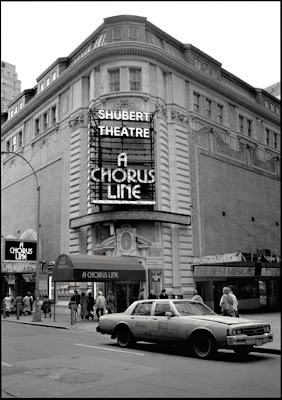 Shubert Alley, the ‘heart of the theater district’ is to the right, leading to 46 Street and the adjacent Booth Theater, built at the same time as the Shubert. Advertising posters now cover both outer walls of the theater, and the zipper display above the door is mercifully gone. I'll assume the wall posters are there with the blessing of the Landmarks Commission, and probably the encouragement of the Times Square BID. I was always amused by the awning. It's at a ninety degree angle to the building, and a forty-five degree angle to the door. I also think it's the only canvas awning over the sidewalk of a legitimate Broadway theater. You never told me you knew Leonard Nimoy!